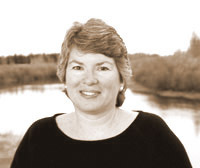 Peggy Shumaker's most recent book of poems is Underground Rivers (Red Hen, 2002). Her first piece of travel writing was recommended in The Best American Travel Writing. Her nonfiction piece "Moving Water" will be included in a new anthology from Norton. Professor emerita at University of Alaska Fairbanks, she lives just downriver from the Alaskan painter Kesler Woodward. Their collaboration of paintings and poems is called Blaze. Shumaker’s poetry appeared in the premier issue of Blackbird and was selected from it to appear on the website Verse Daily. 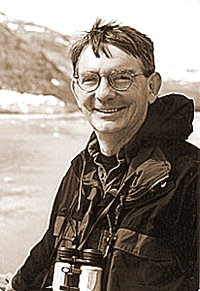 Kesler Woodward was born in South Carolina and has been an Alaska resident since 1977. He has served as Curator of Visual Arts at the Alaska State Museum and as Artistic Director of the Visual Arts Center of Alaska. He is currently Professor of Art, Emeritus at the University of Alaska Fairbanks, where he taught for two decades, serving as Chair of the Art Department and of the Division of Arts and Communications. He retired from teaching to paint full time in the spring of 2000.